This exhibition features weavings from the Inuit art collection, by the artists of the Pangnirtung Weaving Cooperative. WEaving was introduced to the women of Pangnirtung in 1970 as a livelihood opportunity and medium for them to tell the narratives of their lives and represent their culture. The first exhibition in 1972 took place at the Guild of Canadian Crafts, Montreal. Tapestry waeving has since flourished in this small remote community. Donald Stuart, artist for the accompanying Homage exhibition, was instrumental in the founding of the cooperative. 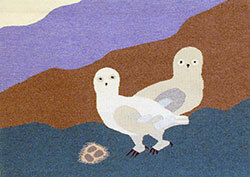 Malaya Akulukjuk, "Nesting Owls." 1984, textile.